On February 21st, Seattle Mayor Ed Murray announced that Rainier Valley would be the location of the third tent city encampment to accommodate the fallout from the Great Nickelsville Diaspora, after the first two Ballard and Interbay locations opened in November 2015. 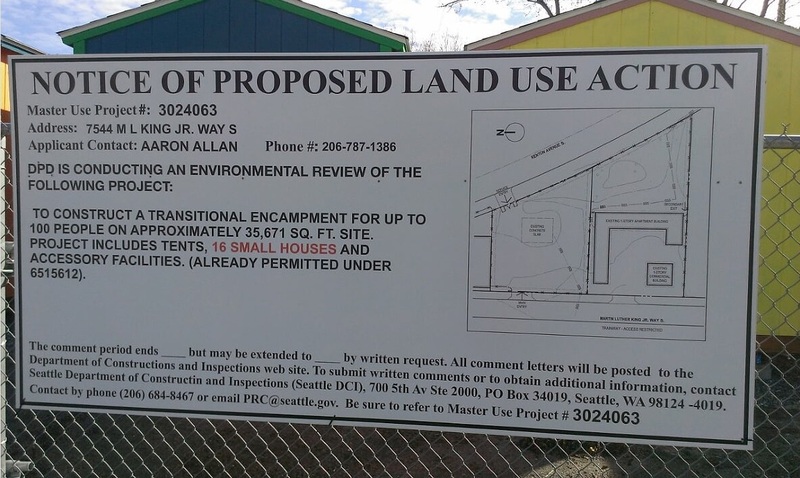 The Low Income Housing Institute received a permit to set up 12 small houses and 33 tents on an empty lot on Martin Luther King, Jr. Way South near the the Othello Light Rail station. Many of the residents are pushing back against this new neighborhood feature, saying that they had no input in the location of the homeless camp, and that it will negatively impact the nearby schools and parks. I live just two blocks north of this new tent city, so I get front-row seats to how the influx of homeless will change the Rainier Valley landscape. Barbara Poppe, who ran President Obama’s US Interagency Council on Homelessness from 2009 to 2014, was hired by Mayor Murray to advise with Seattle homelessness issue… to the tune of $80,000. Poppe doesn’t agree that the temporary tent cities are helping the situation: “I understand there’s a great pressure to have a short-term [housing] solution. But I don’t think these encampments are the best solution,” Poppe told the Seattle Times recently. “You can see it takes a lot of energy to get them running and they don’t solve the problem.” It should be noted that when Poppe visited Seattle in Feburary, she failed to tour any of the three tent city locations in person, despite receiving over $8,800 per month for 9 months of part-time consulting from the city. Homelessness in Seattle is nothing new. Mild climate and soaring housing costs mean that over 10,000 people are homeless in Seattle and King County. But that also means that Seattle is on the leading edge of finding a solution; it was one of the first US cities to use nonprofit organizations to address the causes of chronic homelessness, not just treat the symptoms. The Downtown Emergency Services Center is a prime example, operating nearly 1,000 units of supportive housing, including on-site mental health resources for its tenants. The landscape of Seattle’s neighborhoods are changing. Over the next 20 years, an estimated additional 100,000 will move to the Pacific Northwest. For anyone who isn’t receiving a tech industry salary (Amazon, Microsoft, Zillow, Redfin, Expedia, Nintendo, et cetera ad infinitum…) it can be a struggle to make ends meet. In May 2015, it was calculated that the cost of housing in Seattle has increased 11% over the previous 6 months alone. Many historic buildings are being knocked down to make room for high-density apartment housing – the Ballard neighborhood is an excellent example of this. Developers estimated that 12,000 new housing units were built in 2015, and predict an additional 11,000 units in 2016. With the average renter in the Seattle Metro area paying over 31% of their monthly income towards rent, is it any surprise that an increase in housing costs coincides with an increase in homelessness? Economic experts agree that anything over 30% of monthly income towards rent is considered “unaffordable” – I myself pay over 52% of my after-taxes monthly income towards rent, which is not uncommon among young professionals living alone in Seattle. To phrase it another way: I have less spending money than my teacher friends on the Seattle Public School District payroll, because they have roommates. It remains to be seen how extensively the tent city encampment will change the neighborhood – either positively or negatively. I’ve heard horror stories about local grocery stores closing their bathrooms to the public after finding exponentially more used needles on the floor. But I’m willing to give my new neighbors a fair chance. Over the next several weeks, I will be recording the changes that I see around my neighborhood – the restaurants, grocery stores, gas stations, banks, street corners, parking and traffic developments. My experience will not be indicative of the overall local impacts, but it will be an unadulterated first-hand account of how the Rainier Valley landscape is changing. This entry was posted in The Seattle Scene and tagged Barbara Poppe, Downtown Emergency Services Center, Ed Murray, Low Income Housing Institute, Nickelsville, Rainier Valley, Seattle City Council, Unites States Interagency Council on Homelessness. Bookmark the permalink.